So, I am back. One year 11 months, 21 days later. What happened?, you ask. Well, Brexit happened. And even though it has nothing to do with me, I hit me like a brick wall. I am not going into that now, because this is not meant to be political. It’s just self-justification. A little update of what has gone on in the past year: we are still in Berkshire, painfully slowly getting the house ready to go on the market. If you look through the Instagram posts on the bottom of the page, you might spot some of my home improvements there – and hopefully, when everything is picture perfect, I might post the finished rooms here. Right now, I want to try and get back in the swing of writing every day (or at least most days). Let’s see how that goes. Well, guess what? I am keeping WordPress’s title. Hello world. Though I am not sure I am writing for the world. 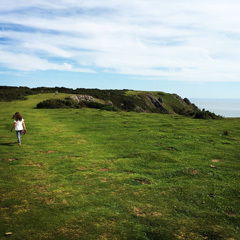 This blog is meant as a diary of the days after we decided to leave our fast-paced life in Berkshire and move to Wales. We have strong illusions that life moves slower and people enjoy themselves more when they live close to the sea. Does that make any sense? I don’t know, but we’re going to try and find out.